Flowers and bees have a wonderfully symbiotic relationship. 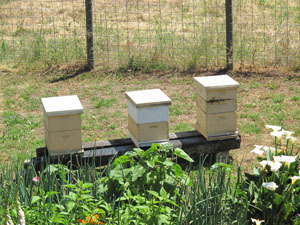 Bees pollinate the flowers and the flowers nourish the bees; happy flowers mean more flowers and happy bees mean honey! 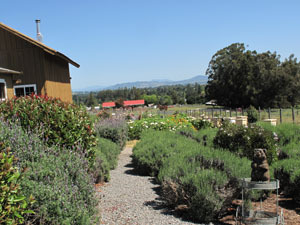 You can learn more about happy flowers and bees at the Lavender Bee Farm in Petaluma, a charming family owned farm known for their lavender and honey products. Being a natural fragrance fan and lover of honey I tried to take a tour of the Lavender Bee Farm for the past two years but was too slow to make a reservation before they were full for the season. This year I was on my game and got myself signed up early. 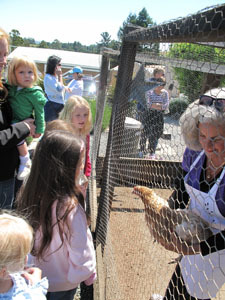 The farm is owned by Jo Ann and Rick Wallenstein; it is their home and has been in Jo Ann’s family since 1947. The lavender and honey business was started by Jo Ann and Rick more recently but the feeling of family history is evident. 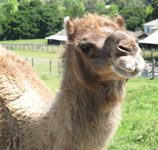 The farm is home to some 5000 lavender plants, about 100 bee hives, a handful of chickens, a pair of horses, a llama and a camel. 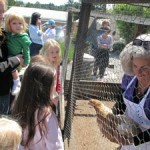 Visiting the farm is a personal experience. 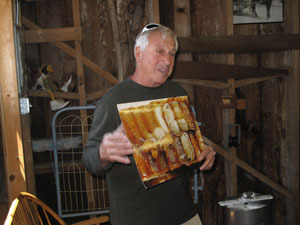 The Wallenstein’s conduct the tours themselves; Jo Ann shares her expertise in cultivating lavender while Rick provides an education in beekeeping. Jo Ann began our tour by introducing us to all of the farm’s animal residents, starting with the chickens then moving to the back of the property where horses, llama and camel shared an enclosure. Mel, the camel, was quick to come for a visit, eager for a little attention, but he moved off when the horses arrived, the king and queen of the corral. Lamar the llama was rather indifferent to paddock politics and just viewed us from a distance. These animals have nothing to do with lavender or bees but for the six little kids on our tour they were a hit! Walking along the edge of the property we passed a small sea of lavender plants neatly planted in rows. It was a significant undertaking to convert the property to lavender cultivation but there is no arguing with the results. Thousands of lavender plants grown together make a beautiful sight; add to them a backdrop of sweeping valley views and it is just gorgeous. Jo Ann explained how all of their lavender is grown pesticide free, hand cut, and handled with care. They grow several varieties of lavender but Provence lavender is their biggest crop, used for products like their essential oil and culinary lavender. 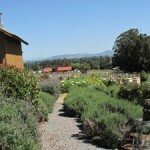 The lavender is just budding out right now and the plants will be ready to harvest this summer. 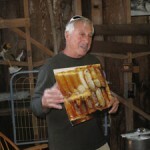 Rick picked up the second part of the tour, teaching us about the complex and fascinating lives of honey bees. His knowledge is extensive and his enthusiasm infectious. I find it very ironic that such a harshly pragmatic society produces the sweet elixir that we love so much. I’m going to overlook the part about the honey being processed in a bee’s stomach. Actually it is a honey stomach, separate from the regular stomach, which is kind of like a built in backpack for bringing honey home. That works for me better visually. Knowing more about how bees produce honey makes me appreciate it all the more, but it also makes me feel just a little bit guilty about taking it away from them. 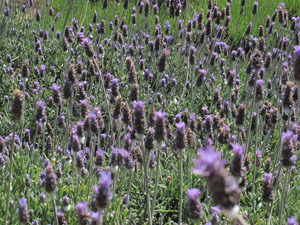 The farm’s thousands of lavender plants provide bouquets, sachets, lavender hydrosol, essential oil, edible lavender, and more; the thousands of bees provide wax for candles. Together they yield the Lavender Bee Farm’s award winning lavender honey, a soft pure unprocessed honey with a subtle hint of lavender. We ended the tour with a tasting of white cheddar cheese dipped in the lavender honey, a perfect pairing, and a sip of lavender lemonade. 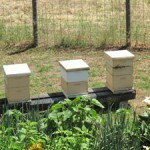 I’ve been nibbling at the honey and enjoying the lavender hydrosol I bought at the farm. But, I’ve been kicking myself for not getting some of the culinary lavender so I could make some of that refreshing lemonade. Thankfully the Lavender Bee Farm will have a booth at our Wednesday night Farmers Market, starting next week on June 2nd. I’ll be there! Pour boiling water over lavender and let sit for 20-30 minutes. Strain and add to ready made lemonade. Garnish with lavender stems and/or lavender buds. 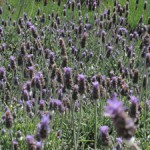 For more information about the Lavender Bee Farm, their online store, recipes, and tours go to http://www.lavenderbeefarm.com/. For more on Backyard Traveler, follow me on Facebook.